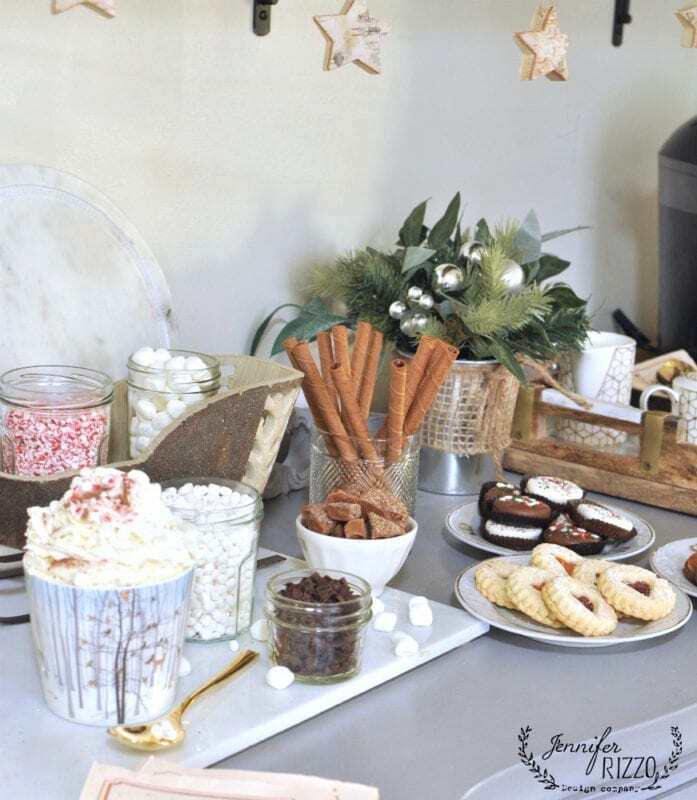 One thing I like to do when I entertain and have people over, besides feed the heck out of them, is make something a little special and fun like this hot cocoa bar. I am a big believer that when people come over,I want to make them feel right at home! I think it makes people feel more comfortable when they aren’t waiting on you and they can feel like they can help themselves. 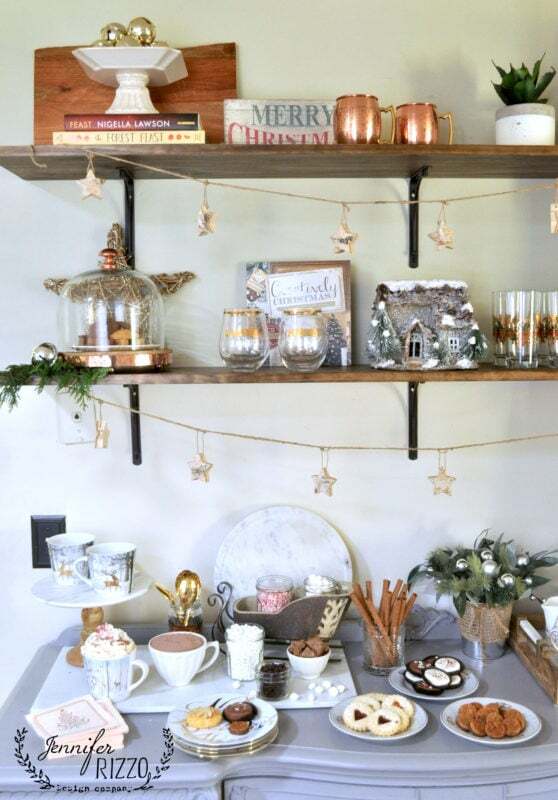 As a part of the Farmhouse holidays series, we are doing dining rooms, but I thought I would share a hot cocoa treat bar, when everyone is sitting around the dining room talking and enjoying each others company. Welcome to my after-dinner hot cocoa bar! I thought some sweet things to drink and nibble on would be a great way to end a wonderful meal and fun time together. 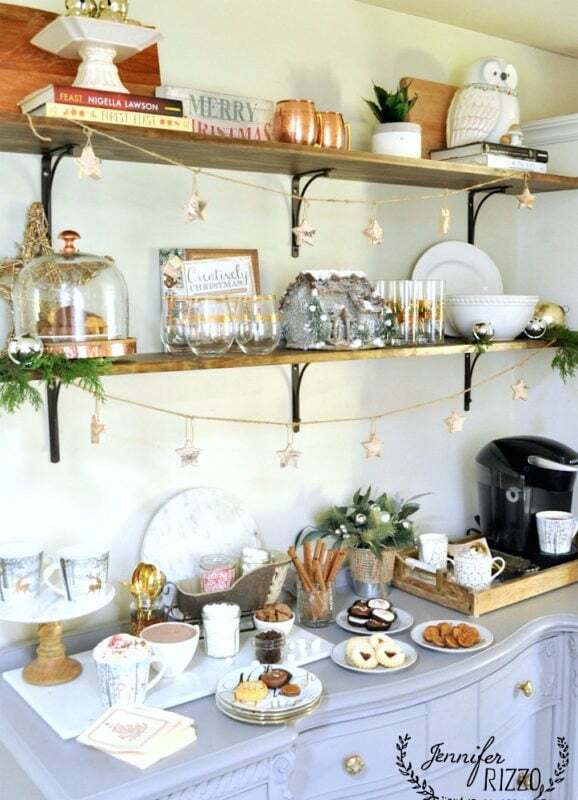 Pretty gold spoons, glittery plates and festive mugs from Homegoods make it easy to entertain! 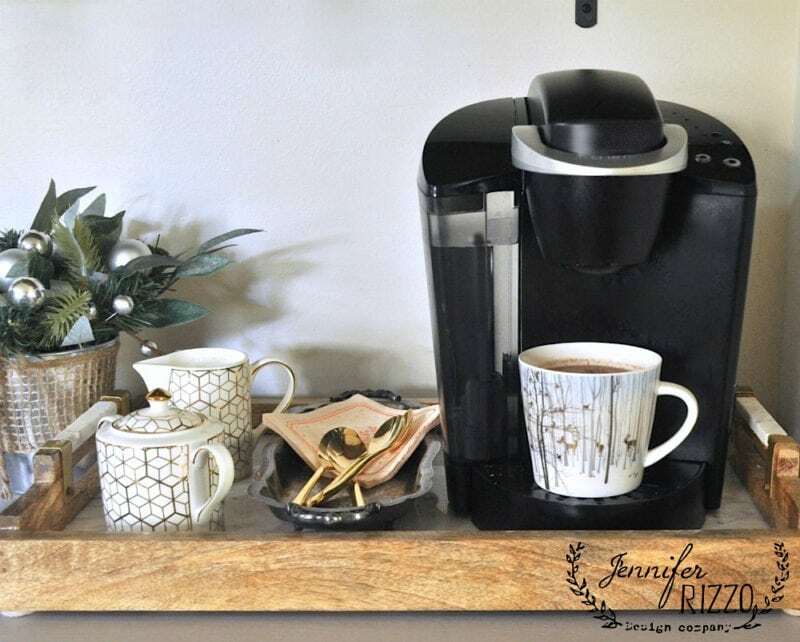 I am even fan of instant hot cocoa, it’s so easy to make when you use a coffee maker that instantly adds the hot water. No mess! For richer cocoa, you can put a container of really warm milk next to it, or if your feeling daring, cream! I keep some cream and sugar next to it in case someone would like coffee instead. Who doesn’t love cookies and hot cocoa with fun stuff to add in? 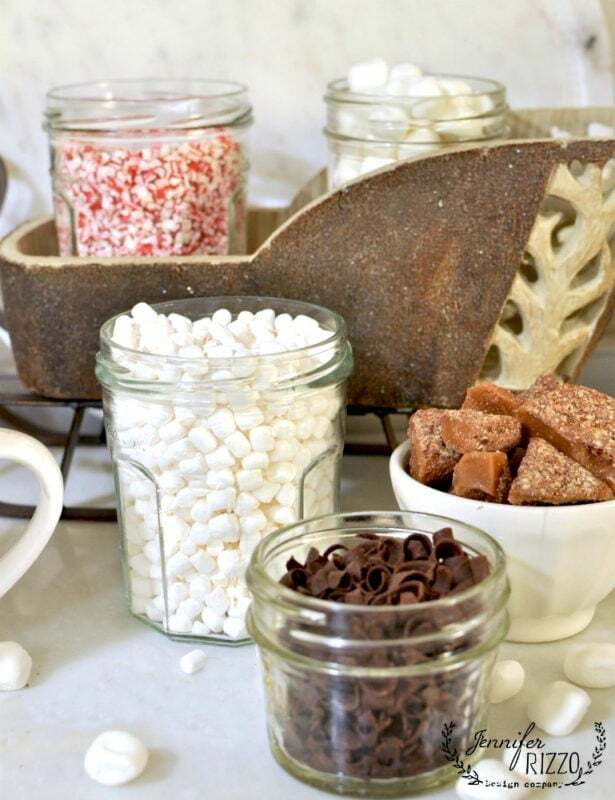 I love putting out crushed candy canes,mini-marshmallows, dark chocolate shavings and even some toffee as different ways to flavor all that chocolatey goodness in a cup. It makes the drink it’s own dessert! Acute mini-sled from Homegoods was the perfect place to put some of the toppings. And of course, you can’t forget a huge pile of whipped cream! I found some yummy chocolates and Italian cookies for my cookie bar. I arranged them on vintage salad plates which are the perfect size so there’s room for multiple kinds of sweets and for people to nibble on. I had a hard time keeping the kids away until after I was finished photographing the hot cocoa bar. They were all over the chocolate covered sandwich cookies the minute I said I was done. I love the peppermint roll cookies myself. I also decorated the shelves above the bar for some holiday cheer. The very top shelf has some fun stuff like a owl cookie jar I bought a few years ago. I added some giant jingle bells on a cake stand, and a festive Merry Christmas sign. 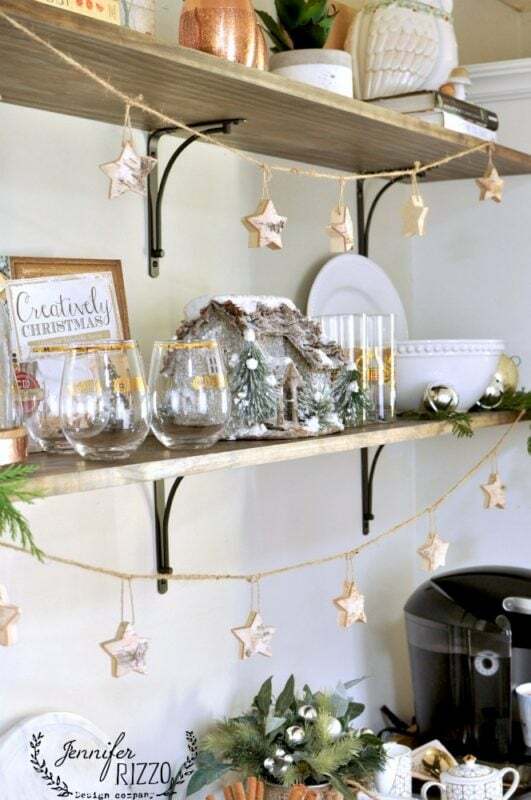 I found these amazing birch star ornaments and hung them on some twine to make this adorable garland! 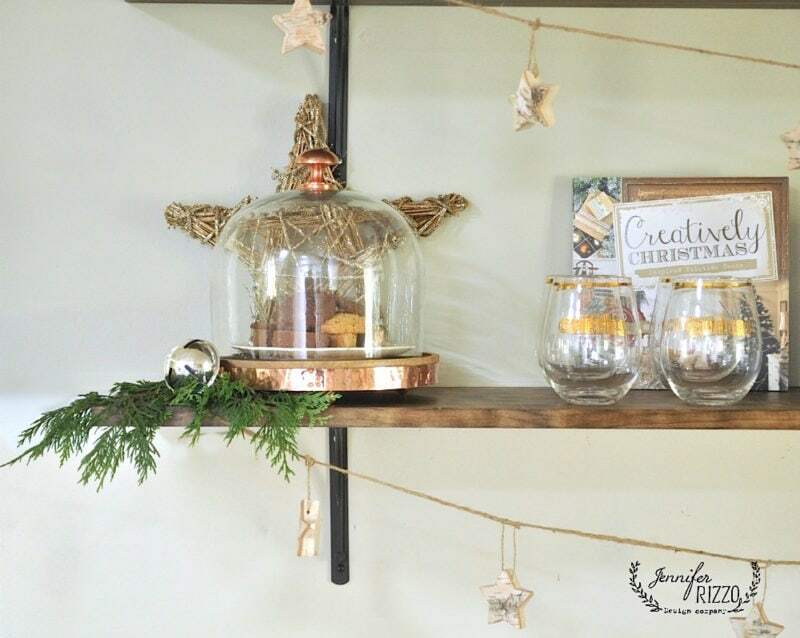 This copper topped cloche was the perfect way to store the extra cookies, with a sparkly star behind it! I added some cedar greenery from our yard. I LOVE the combination of copper and greenery. These were some of my favorite Homegoods finds! 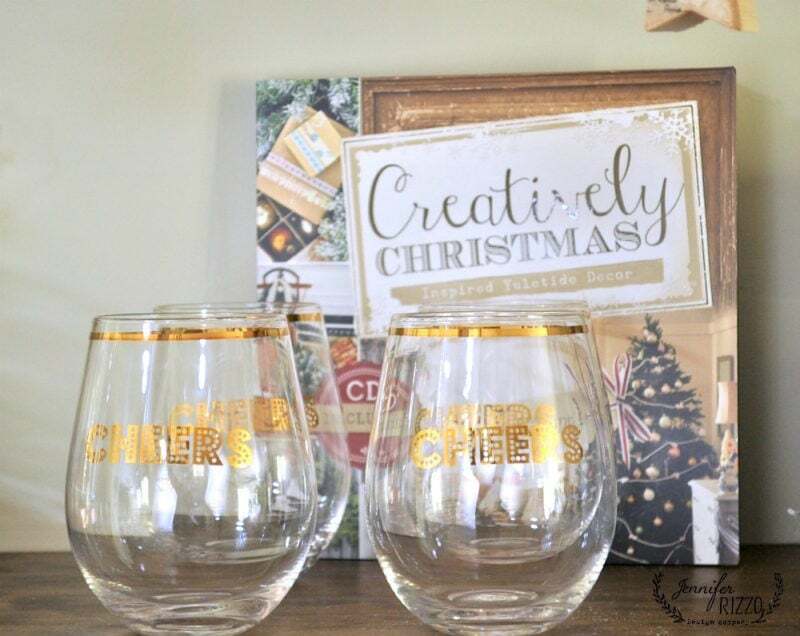 Of course, these stemless wine glasses (full of wine) and a copy of my book Creatively Christmas are a great way to get in the holiday mood! 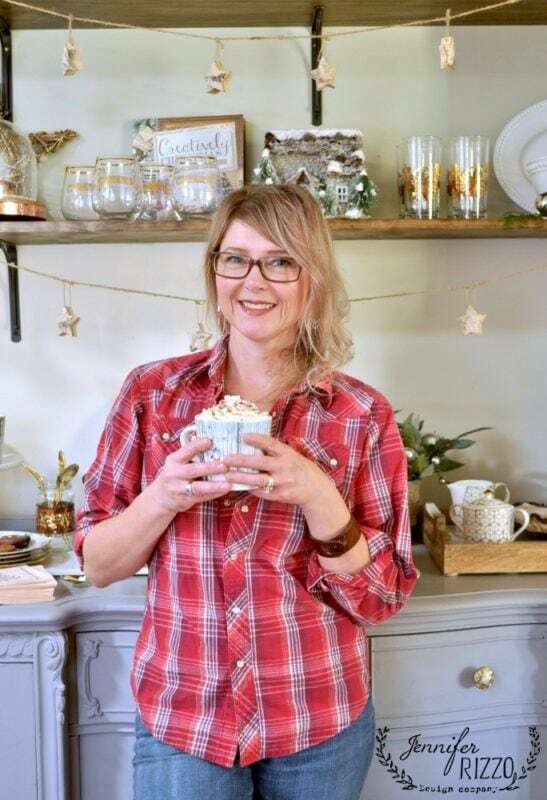 I loved this cute mini-cabin and knew it was perfect for the spot between my Cheers glasses and my vintage drink-ware. It was really easy to put together, and even more fun to make myself a cup of hot cocoa, and have a cookie when I was finished! 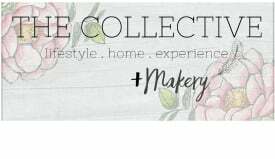 Stop over here to see the 2016 30+ house holiday housewalk, full of all kinds of decorating inspiration!!! If you’re looking for holiday goodies for your home, you can also check out my shop here. 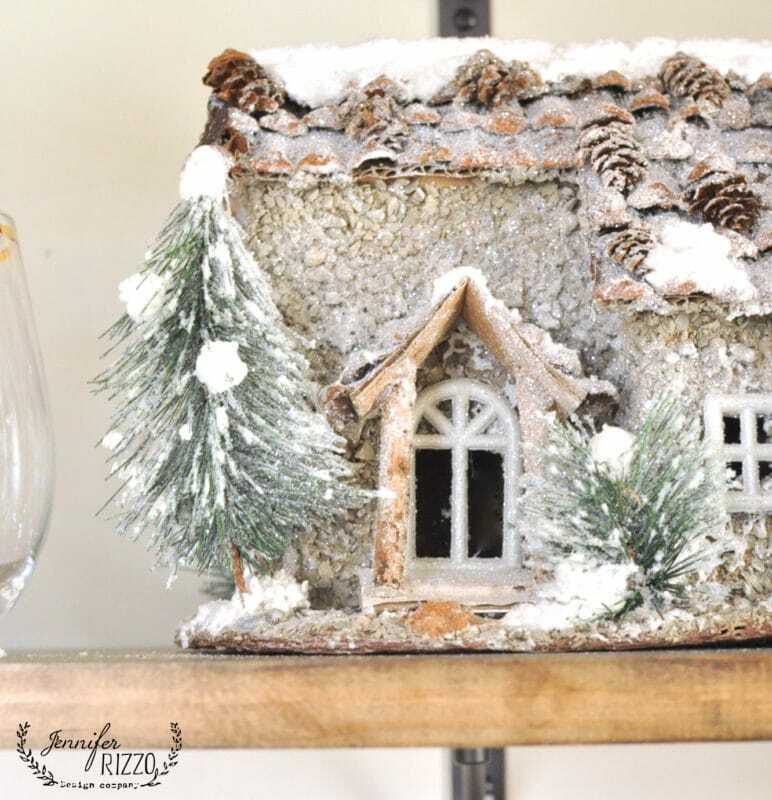 Come and check out the other bloggers and their spaces dressed up for the holidays! I can’t decide whether my favorite part of entertaining for the holidays is baking fancy treats, or decorating! I love them both. You cocoa and dessert bar idea is a great way to indulge both 🙂 Than you for sharing! Christmas morning breakfast with my Momma and Sister, hubby and 3 kiddos. The first round of presents have been opened and we get to sit and chat at the table with our favorite breakfast foods until the next round of present opening ensues. The fire crackles and the village on the mantle glows and it is purely magical. I love all the prep of cooking for my family, and then when gathered, sitting around visiting and telling stories…enjoying the feeling that everyone everywhere just kinda “stops” and we can soak in those few days. Thanks for sharing! It’s all so beautiful and makes me wish i was drinking cocoa with a good book rather than about to head into the office! When will the Christmas tour start this year? I can’t wait to see all of the lovely homes! Love all of your festive touches. I am enjoying seeing the ideas early so I can get inspired. I love getting all of my decorations out and setting them up in new ways. But my favorite part of the holidays is seeing family that are far away. We have a christmas brunch when they are all here. My favorite part of entertaining doesn’t involve extra guests, it just involves my husband and kids. We make a special treat (that the kids pick) and hot chocolate, then sleep under the glow of the tree lights. No one extra on that special night, just us entertaining each other before more parties take place. I love having everyone one over for a simple, serve yourself dinner. Yummy baked ham for sandwiches, a salad or two, chips and a couple of desserts. Fun times! I love the way my house looks-though I have tried to pare it down a bit- with the fresh greenery and just a “merry” look!! Family visiting with each other, telling stories, laughter and good friends dropping by …. I love to have goodies for them! and reading the Christmas story together, its all so good. 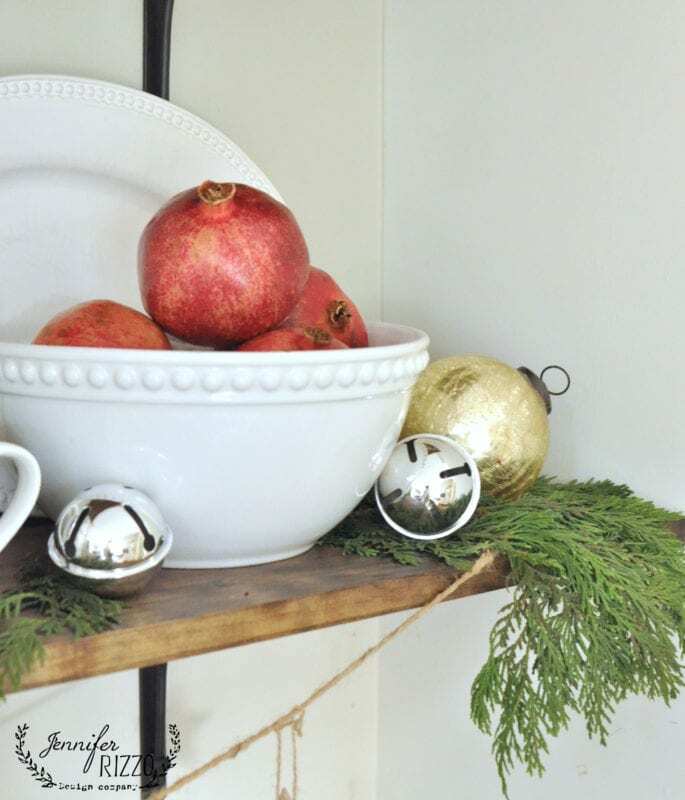 I love creating Christmas vignettes around the house. 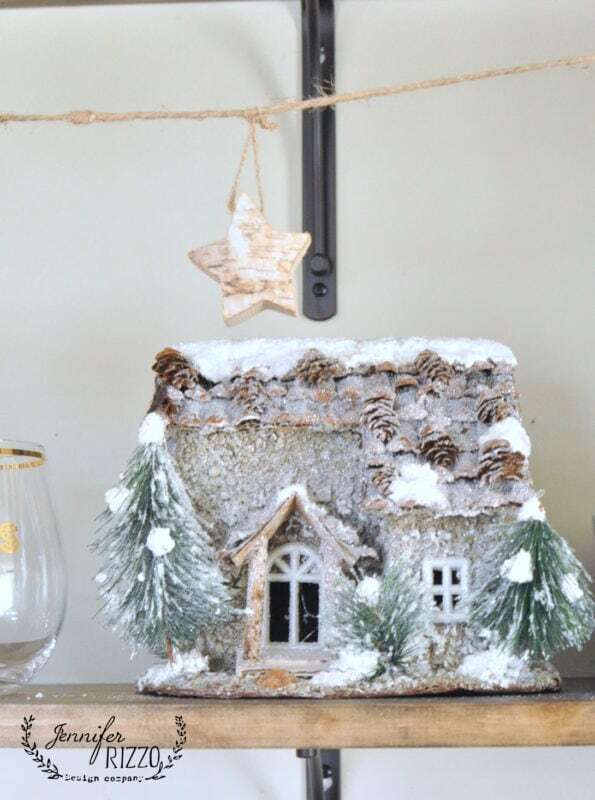 I decorate the fireplace mantel with green boughs, twinkle lights and tiny houses. Our nativity set goes on the buffet in the dining room along with green and vintage ornaments hanging from the chandelier. I think my favorite is our Christmas tree filled with vintage ornaments that I’ve collected over the years. Entertaining for the holidays is always, always, the best with family and best friends! That’s really cute! Love the little sleigh holding the peppermint & Marshmallows. My favorite part of entertaining is the planning and executing my details. So much fun. Thanks. My favorite thing is making cookies with my girls. I love it cause we get to create and have fun. I love that we are making the best memories together. I have a few favorites, spending time with family, decorating every year, having different themes, cooking and baking our favorites dishes. Love your Christmas ideas! My favorite part of Christmas is decoration and shopping for the ones I love. Nothing is better than having family together to enjoy each other at Christmas time! My favorite part is seeing the excitement on my little girls’ faces during the festivities! I love my annual cookie exchange! It’s fun to get everyone together (ladies only!) and share our festive creations! Thanks for the giveaway! My favorite part of entertaining is giving people memories they will cherish. My favorite part of entertaining is serving the same traditional food each year- pfernuisse, Christmas spice bread, and eggnog to name a few! I like putting parties together for my teenagers. 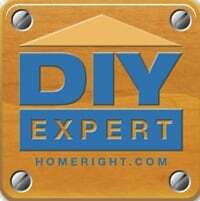 Build your own pizzas and ice cream sundaes and a hot chocolate bar. My favorite part of entertaining is setting the table and also creating a welcoming, cozy, warm atmosphere in our home! My favorite part of the holiday season is the sheer anticipation of it all. It starts with the cooler weather, gray skies and blazing fires. The twinkling glow and the oven that is housing the most decadent cake, while watching the classics that usher in the season. I always have a hot cocoa bar too! Its most cozy this time of year. I love all of the baking and having a house full of family and friends. My favorite part about entertaining for the holidays is the wonderful part when everyone is there and the candles are flickering, the fireplace is cracking, the Christmas hymns are playing, everyone’s relaxed and laughing and I feel so blessed that I know such wonderful people and that maybe in some small way I’m being a blessing to them. I love having family here and eating and serving all of the holiday goodies. 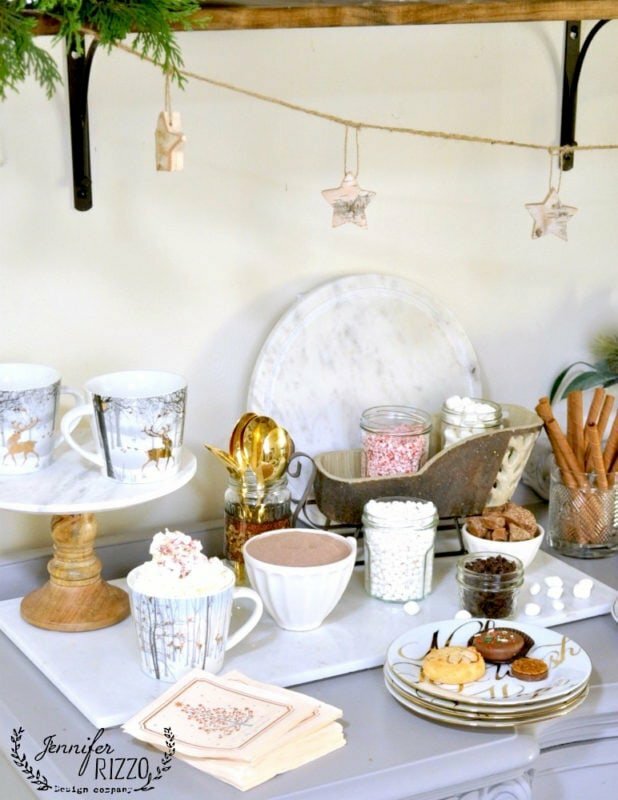 Your hot cocoa bar is so inviting and cute. Love Homegoods! First love your woodland mugs and your whole look. I am southern..therefore an entertainer..it’s in my DNA…and, love every aspect of it..well not the clean up so much. But, nothing better than cooking for days..baking too..heavy laden tables of deliciousness, full bellies, happy faces..lots of laughter and love. Cooking and baking things from my family’s past & decorating with ornaments loaded with memories: these are my favorites. I love entertaining during all times of the year but the holidays are extra special. I love decorating my house and how cozy entertaining is. 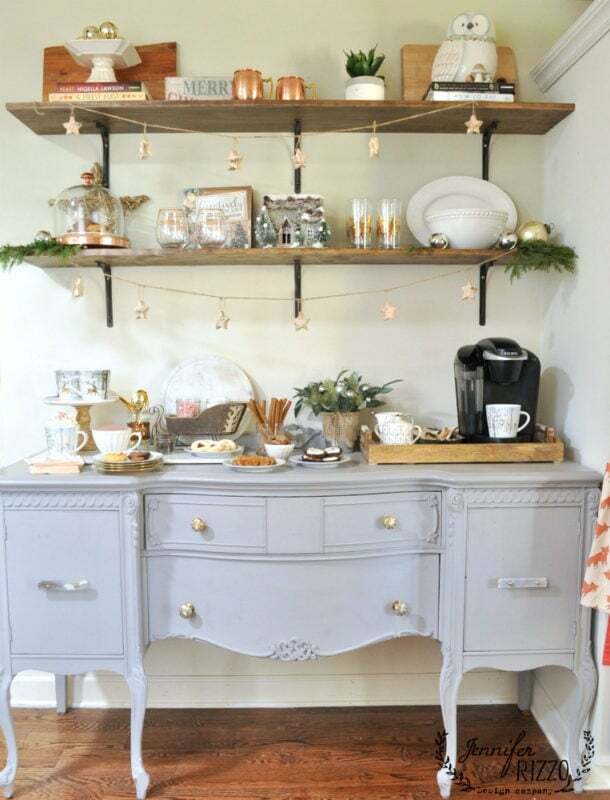 I host a Ladies Holiday Open House every year and it’s one of my favorite traditions. My favorite part of entertaining for the holidays is a casual game night. Friends gather around our dining table and we enjoy playing new board games or old favorites like Farkle, and Mexican Train Dominoes. The food is casual too. Usually chips and dip, cheese and crackers, and Christmas cookies. It’s all about fun and not formality. My favorite part of entertaining during the holidays is pulling out the tried and true recipes from my mother, grandmother and mother-in-law. I can’t seem to get away from the bourbon fruit cake and eggnog. Always so good and requested each and every year by relatives. There is nothing better than to walk into our house and smell the aromas of these goodies. Coupled with the decorating of the tree with all of the ornaments that have been collected within our 31 years of marriage says nothing more than “tis the season.” All the memories of each and everyone of these ornaments flood back into the present and brings such a smile to everyone involved. So much fun!! Those Cheers glasses are the best! I love bring all my family together for the holidays! We have a very small home and two little children, so hosting doesn’t happen too often, but I love each Sunday night of Advent to have a candlelit celebration with our own little family: fire in the fireplace, Advent wreath lit, prayer, reading and singing, some special holiday treat to share…. I love all the laughter and traditions. I’m a fan of mixing inherited pieces with fun new finds. I love everything about the holidays…..the entertaining, the cooking, the baking, the conversation. 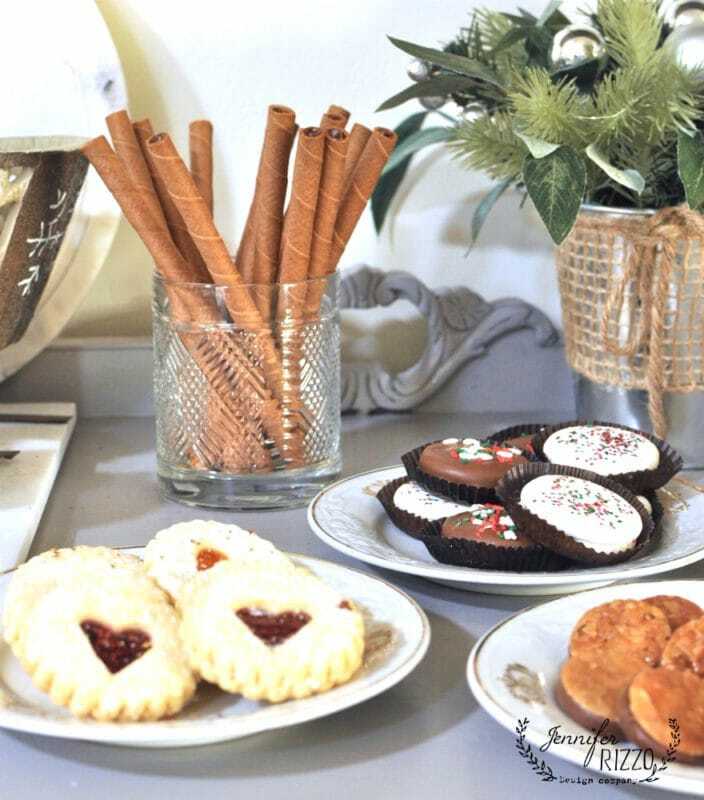 Seeing everyone around the table savoring a fresh baked good with a nice cup of coffee….it’s just awesome. 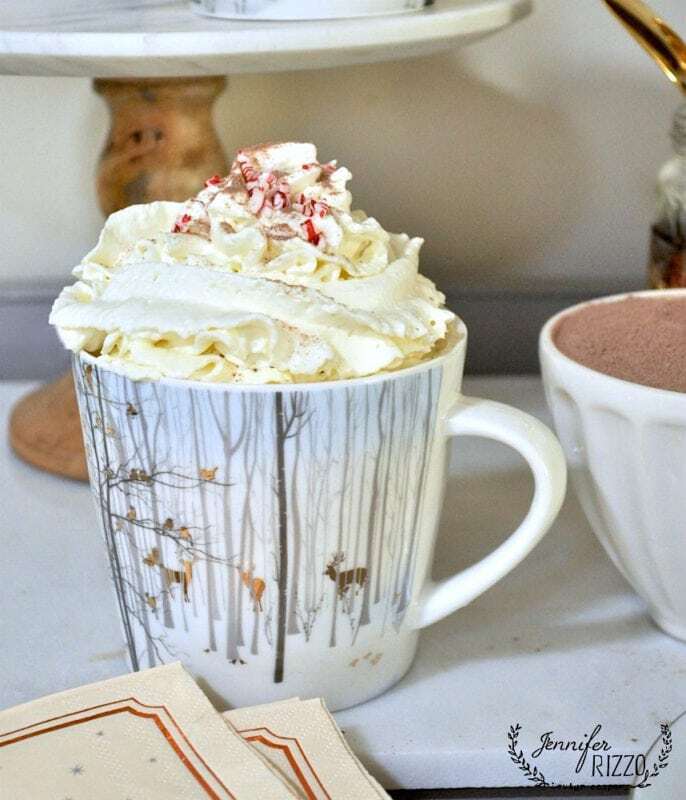 Hot chocolate and copper – perfection! Christmas morning brunch with our five grandchildren, four little girls in their Swedish sweater dresses and tights, and one handsome leader of the group in a tie, saying the grace. This is all lovely–I like the little rustic house. So sweet! This arrangement is so rustic looking and beautiful! 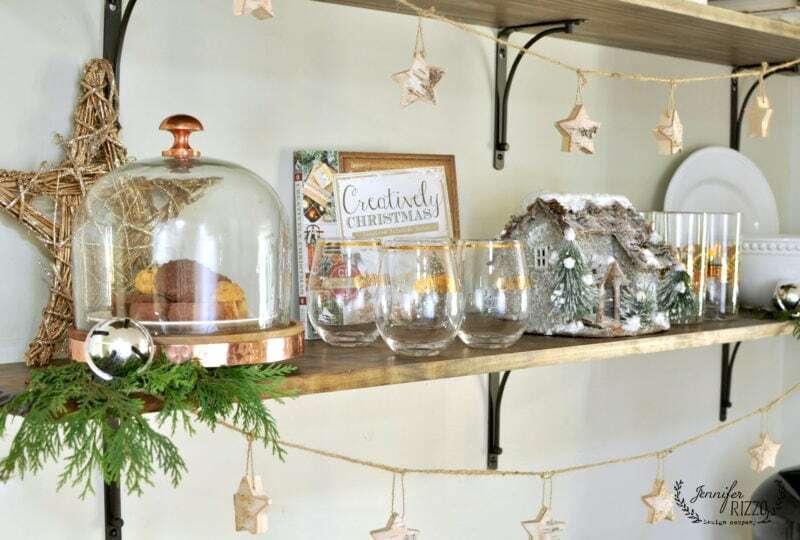 I love the copper topped cloche a lot. Everything is so beautiful and inviting! I have to ask, what paint color is that gorgeous buffet? It’s a decoart color! if you search painted buffet, it tells you the exact color. I think it’s called Artifact. Beautiful set up! So festive and fun! Also, thank you for hosting the Christmas walk…so much eye candy! I look forward to it every year (it’s also one of my favorite Christmas time tradtions!) 🙂 As for entertaining, I love the first chance I get after running around like crazy, when I get to sit down with a glass of wine and chat with family/friends or to steal a moment watching my kids play with their newest treasures. Happy holidays to you and your family! What an adorable way to make use of space, it’s so nice to see small spaces get some glory. We live in a “cozy” home and I would not have it any other way. My favorite part about hosting for the holidays is getting out the decorations and being reminded of things you forgot you had, it’s always a fun surprise. My family loves seeing what I will do with my decorations from year to year. I just may have to have a hot cocoa bar this year!